If there’s one thing we can no longer ignore as consumers, it’s plastic pollution. Did you know that approximately one million plastic bottles are bought around the world every minute? Or that an estimated 73% of all beach litter is plastic? How about that plastic is killing more than 1.1 million seabirds and animals every year? Documentaries like Attenborough’s ‘Blue Planet II’ are doing an excellent job in bringing this issue to the forefront of public consciousness. But it’s more important than ever that we pull together in an effort to clean up our oceans. Fashion brands in particular have been urged to take action as key contributors to the epidemic. Friends of The Earth says washing clothes in the UK creates around 4,000 tonnes of plastic microfibre pollution every year – of which 1,600 tonnes could find its way into our rivers and estuaries. From high-performance trainers to chic eyewear, these are just some of the brands saving the oceans in style. Adidas and Parley for the Oceans — an environmental organisation raising awareness around marine pollution — recently made history with the first high-performance sportswear range made from ocean plastic. Parley collect plastic waste on beaches which they then turn it into a yarn used to manufacture clothing and footwear. They have partnered with several brands, with Adidas perhaps their most successful collaboration yet. The sportswear brand have set an ambitious goal to increase production from five million pairs of ocean-friendly trainers in 2018 to eleven million pairs in 2019. For those of you unfamiliar with Canadian-founded Matt & Nat, they are a cruelty-free vegan brand selling a range of bags, footwear and other accessories. But, as an added incentive for the environmentally-conscious customer, they also use a fabric made from recycled bottles to make the linings of their bags. For each bag produced, approximately 21 bottles are recycled. Still not sold? They’re now using recycled bicycle tires as new material. H&M was one of the first international brands to make a statement around plastic waste with its Conscious Exclusive collection. Now in its eighth year, the line promotes the use of recycled materials in crafting high-quality womenswear, lingerie, shoes and accessories. Last year’s range even featured a gorgeous lace wedding dress made from organic cotton and recycled ocean waste like discarded fishing nets. Fans of C4’s ‘Made in Chelsea’ may recognise Riley Uggla as a former star of the show, who last year decided to follow her passion to create sustainable clothing brand, Riley Studio. Her idea was simple: use waste materials and natural fabrics to produce durable and versatile fashion. The result? 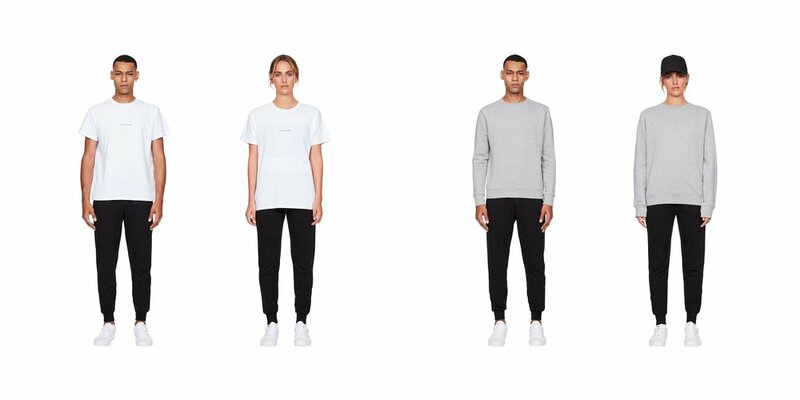 A quality collection of gender-neutral loungewear including simple sweatshirts and activewear made from Econyl — a recyclable fabric consisting of fishing nets and ocean-polluting plastics. Her debut collection alone upcycled 1,167 plastic bottles. Shop the latest here. Not only is this brand incredibly size-inclusive (selling sizes XXS—6XL in leggings and XS—3X in bras) they are also dedicated to sustainability within fashion. Girlfriend Collective partners with a recycling centre in Taiwan — the state formerly known as ‘Garbage Island’ — using the plastic waste to create their super-soft products. Their new LITE Collection is made using fishing nets from across the world, with one percent of all sales going to Healthy Seas, an organisation helping to remove nets from our oceans. Barcelona-based Sea2see helps fishermen operating off the coast of Catalonia bring in a tonne of plastic waste every three days. That plastic is then used to make chic designer eyewear, with 10kg required to make every pair of glasses. Any remaining waste is then sold to other manufacturers, with many using it for nylon threading. An incredible 90% of what they recover can be recycled. Those with perfect vision can bag themselves a pair of sunglasses instead.